Description: One of my favorites, this design has a cathedral ceiling over the main living space, wood stove, passive solar design and large porch on the west to block the hot afternoon sun. There is a large loft over the bedrooms and bath. This new version has three bedrooms. 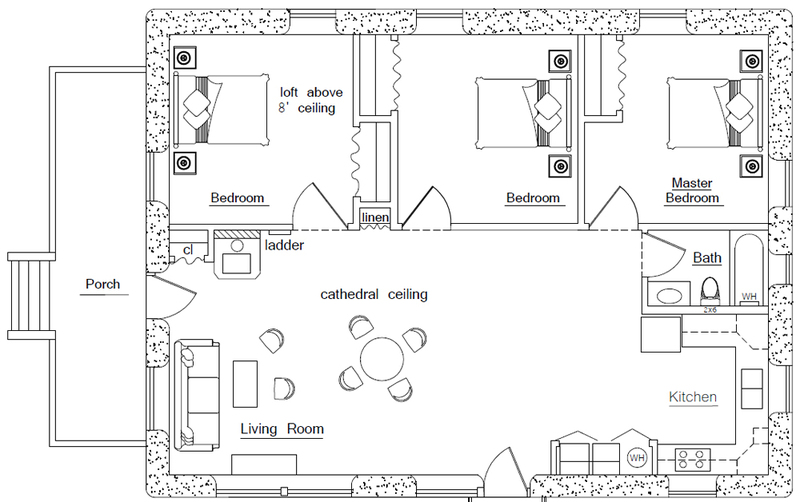 The original Crow house design has two bedrooms. do you have the building blueprints for this crow house? Yes, everything is complete. Email me at strawhouses [at] yahoo.com for ordering info. My husband and I really like this one. I’ll be saving this for when we get ready to make our final decision on a design. Thanks, Owen! Looks like it’d be a great candidate for a masonry heater with an oven built into the kitchen side, with the extra floor space. Good idea. I typically just show the minimum number of features to keep costs low. The Crow plans are $200. That includes a free copy of my earthbag book. I like the earthship designs, but I recommend using earthbags instead of tires. Try a sample of both methods and see what you think. Earthbag building is at least twice as fast. Maybe 3-4 times faster with a good crew using tubes. Is this plan code-compliant for SC (primarily York County)? Are we able to take these to the city and get a permit to build? You have to do a cost estimate based on local prices. Also note, there’s a thousand ways to do things. One person will go to a Home Depot and buy everything retail. Another will shop for dented or returned windows and doors that are way less expensive. Some people will get recycled materials from carpenters or thrift stores. Some have lots of codes, some of few or none. Some want to do all the labor, some don’t. So it’s impossible to give you a quote that’s meaningful. You can build at $10/sq. ft. with no codes or $50-$100/sq. ft. with codes. Mr. Geiger, I found the original crow for sale, but I’m really interested in this plan with a few modifications. How can I order this and from where? Can we build this home with Cob instead of Earthbags? Yes, but it will take at least several times longer. That said, speed isn’t everything. Some people don’t like the hard physical aspect of tamping and working with bags. Working with cob is sort of like a bird building a nest one bit of mud at a time, totally naturally. That’s a great ideal to strive for if sufficient time is available (probably several years in this case). But obviously most people want to at least get the main shell erected in one building season. Leaving a partially completed wall structure open to the elements is inviting problems. It’s best to get the walls and roof completed before winter or heavy rains can cause damage. That’s why we typically recommend earthbag or strawbale building. 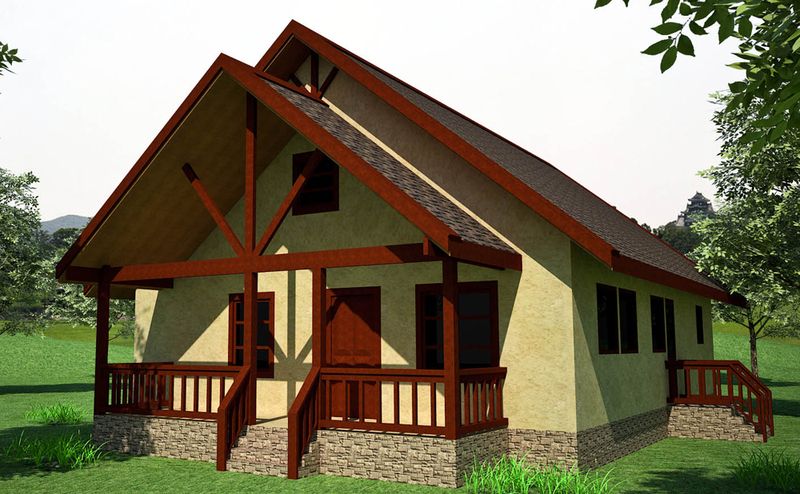 One option is to build a post and beam frame, and complete the roof before doing the walls. This method can be used with cob, earthbag, straw bales, etc. This allows you to work out of the elements and prevent damage to the walls. It’s also the easiest to get approved by codes. Has anyone built this or the orginial Crow? Looking for pictures or a video tour of how one turned out. This one is quite popular, so I’m sure it’s been built somewhere. Most people shun publicity and do not publicize their projects. Im interested in estimated final cost for a home like this. Owen, do you have any advice for building in polar climates? We are in Alaska and are very interested in earthbag construction but have only seen 1 done here. Thanks! Owen, Will i need an engineering stamp in New Mexico and do your plans come with one if so? Hi, Owen! I love this plan. A few questions: what are the interior dimensions of the individual rooms? What are the roof’s pitch and surface area? Also, what are your thoughts on metal roofing for this particular design? I think that’s all for now 🙂 Thanks for all your awesome info and great designs! I don’t have the room sizes handy. The plans are drawn to scale so it’s easy to calculate. Metal roofing is probably the best choice. Adjust the pitch to your area. That’s easy to do if you order roof trusses. Roof area = the floor area for calculating roof water catchment. Area of metal roofing will vary according to the pitch.